WASHINGTON, DC, February 21, 2013 (ENS) – Exploration and development of lands containing about three-quarters of the economically recoverable oil in the National Petroleum Reserve-Alaska will be permitted, under a Record of Decision signed today by Secretary of the Interior Ken Salazar. At the same time, the decision protects natural resources in the 23-million-acre Reserve. The protected resources include critical areas for sensitive bird populations from all seven continents and for the roughly 400,000 caribou in the Teshekpuk Lake and Western Arctic Caribou Herds. Subsistence users in more than 40 villages in northwest Alaska rely on these caribou herds. “The balanced approach under this plan is the result of extensive local input and will help guide the responsible production and transport of the substantial oil and gas resources in and around the Reserve,” said Salazar. “This comprehensive plan will allow us to continue to expand our leasing in the NPR-A, as has happened over the last three years, while protecting the outstanding and unique resources that are critically important to the culture and subsistence lifestyle of Alaska Natives and our nation’s conservation heritage,” he said. The U.S. Geological Survey estimates that the Reserve has between 5.9 and 13.2 billion barrels of technically recoverable oil with a mean estimate of 9.3 billion barrels. 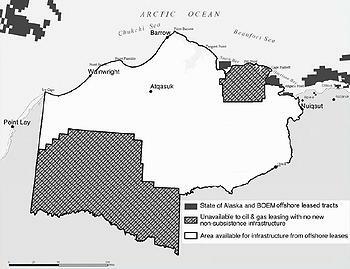 The decision makes all lands along the Chukchi Sea coast, most of the lands along the Beaufort Sea coast, and other lands available for pipeline route applications and other infrastructure that would support offshore oil and gas development. The document provides explicit confirmation that pipelines carrying oil or gas from operations in the Chukchi and Beaufort Seas can be constructed through the NPR-A in the future. The decision creates the Peard Bay Special Area and enlarges the Teshekpuk Lake and Utukok River Uplands Special Areas, expanding protected Special Areas in the NPR-A from 8.3 million acres to 13.35 million acres. The NPR-A’s Teshekpuk Lake Special Area was of foremost concern for Ducks Unlimited during the planning process. 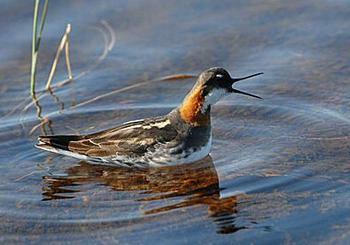 It is the center of the world’s largest Arctic wetland and the heart of an international waterfowl migration. The plan released today indicates that 11 million acres, including approximately 3.1 million acres within the Teshekpuk Lake Special Area, will be dedicated to protecting critical areas for waterfowl and other birds and will not be made available for oil and gas leasing. The plan, detailed in the Final Integrated Activity Plan and Final Environmental Impact Statement, IAP/EIS, for the Reserve, is the first management plan that covers the entire reserve, including 9.2 million acres in the southwest area. Previous plans covered only the northeast and northwest planning areas. After receiving more than 400,000 public comments and following two days of meetings and visits with North Slope leaders in August 2012, Salazar announced the Preferred Alternative, which was adopted by the Record of Decision he signed today. The Final IAP/EIS, released in December 2012, was developed through “extensive consultations” that considered the viewpoints of Alaskans who live in the region, tribal governments, the State of Alaska, industry, environmental organizations and other stakeholders and federal partners, Salazar said. The Bureau of Land Management hosted seven public meetings and Alaska National Interest Lands Conservation Act subsistence hearings in North Slope villages. The BLM also held meetings in Fairbanks and Anchorage. Following release of the Final IAP/EIS, the federal agency held meetings in North Slope communities to receive recommendations on future ongoing outreach efforts with communities within or near the Reserve. Based on these consultations, the Record of Decision requires that BLM establish an NPR-A Working Group that includes representatives of North Slope tribal entities, Native corporations and local governments. The Working Group will provide input on the full range of management issues and possible future development in the NPR-A, including pipelines and related oil and gas infrastructure development. The group will be a forum to gather more scientific information and traditional knowledge about wildlife populations and needs. It can inform adjustments to the boundaries of special areas, including potential future adjustments to the southernmost boundary of the Teshekpuk Lake special area. Large populations of geese from Canada, Siberia, and other regions of Alaska travel to Teshekpuk for their molt, when the birds temporarily shed their flight feathers before heading south. During this time, geese and their offspring are particularly vulnerable. The NPR-A is one of the Arctic’s greatest migratory bird nesting and molting areas and is the summer home to hundreds of thousands of birds. It provides critical molting areas for up to 30 percent of the entire population of Pacific Flyway brant, 25 percent of the midcontinent population of greater white-fronted geese and a growing number of lesser snow and Canada geese. The NPR-A Record of Decision and related documents are online at http://www.blm.gov/ak and at the BLM-Alaska Public Room at 222 W. 7th Avenue #13, Anchorage, AK 99513-7599.